Quail is Queen in this doozy!! Keep the sides simple and allow the quail to steal the show. Melt butter in a saucepan over high heat, then cook until it turns nut-brown (2-4 minutes). Add KNORR Professional Garlic Puree, herbs and KNORR Portuguese Peri Peri Sauce GF. Transfer to a bowl and set aside. Wash quail and pat dry with absorbent paper, wrap each in a slice of prosciutto, then transfer to a small roasting pan. 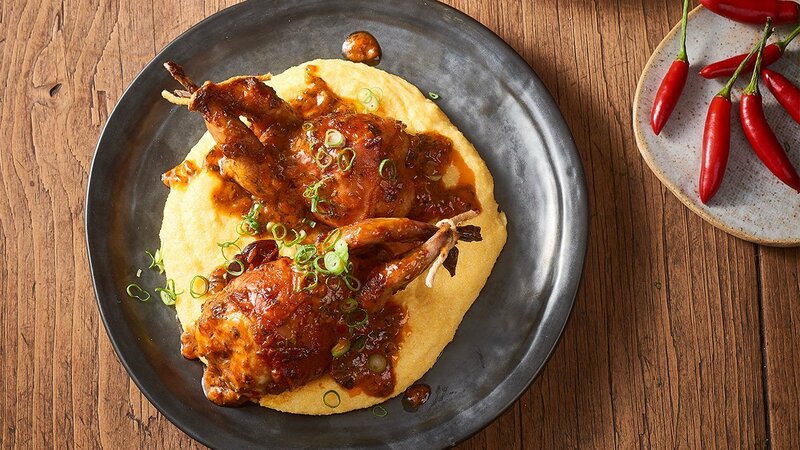 Brush quail with spiced herb butter, season and roast until golden and just cooked through (20-25 minutes). Set aside to rest for 5 minutes. For polenta, mix water and KNORR Concentrated Liquid Stock, bring stock and milk to the boil in a saucepan over high heat. Add polenta in a thin, steady stream, whisking continuously until incorporated, then reduce heat to medium-low and cook, whisking occasionally, until thick. Before serving, whisk in parmesan and butter and season to taste. Divide polenta among warmed plates, top with quail, spoon herb butter on top.